Country: USA Wingspan: 36' 2"
Year: 1949 Length: 27' 4"
Horsepower: 275 Gross Weight: 3350 lbs. 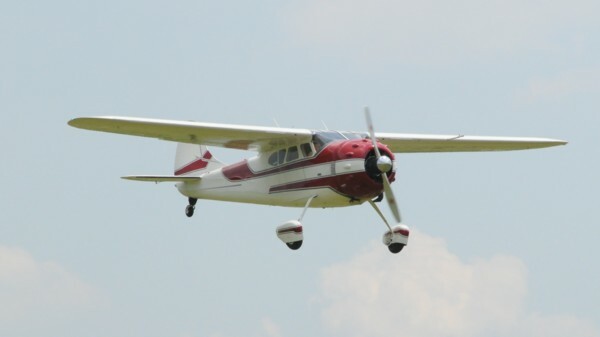 The Cessna 190/195 series of airplanes were produced between 1947 and 1954. The "Businessliner" was the last of the United States produced cabin class airplanes with a radial engine. With seating for five adults this was Cessna's version of the modern corporate airplane. This 195 was purchased new by the Big Chief Drilling Company of Oklahoma and used as a company aircraft. It changed owners many times until it was severely damaged in a take off accident in 1980, then left abandoned. Acquired in 1985, it took four years to restore to its present condition.